Today’s card — the Ace of Cups — is all about romance, affection, flirtation, intimacy, communion and most of all love. 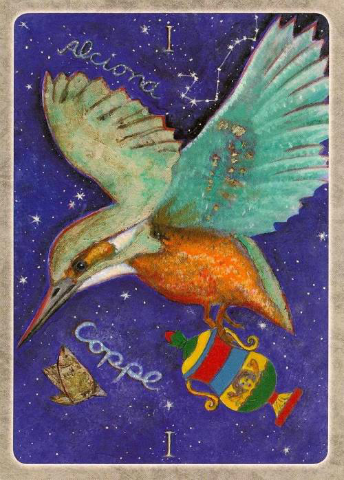 In this version of the card, a beautiful Kingfisher spreads its wings across the night sky, carrying a bright and colorful vessel. 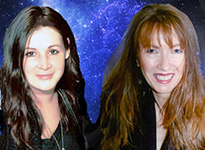 The words Alciona Coppes are made up of twinkling stars with Pleiades shining brightly in the background. Alcyone (Alciona) is the central or brightest star in the Pleiades, which due to the precession on the equinoxes has only recently moved from Taurus into Gemini.